Amazingly, this is the fourth Layer Cake wine I have reviewed. I've already formally reviewed their Primitivo/Zinfandel (2008), Shiraz (2010), and their delicious Malbec (2010). Well now, it's time for their Cabernet Sauvignon, the 2010 Vintage to be precise. Now unlike many of Layer Cake's wines that are sourced from outside the US, their Cabernet Sauvignon is one hundred percent pure Californian Cabernet Sauvignon. The company claims the grapes are from two vineyards, one in Alexander Valley and one in Paso Robles. 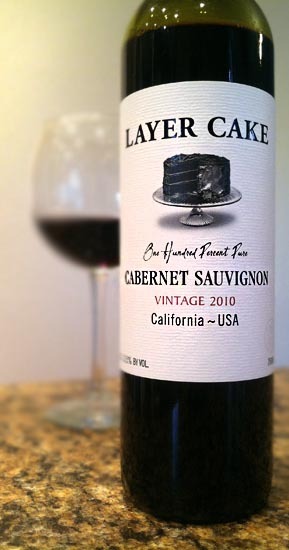 The 2010 Layer Cake Cabernet Sauvignon pours a deep, deep ruby red and has aromas of black raspberries, cherries, and spice. Tasting brings dense mouthfilling raspberries, dry cocoa powder, spice, some herbal earthiness that's a bit like bay leaf and basil combined, a bit of meatiness, finishing with quite a bit of oak, and an underlying dark chocolate base with a nice moderate chewiness. All in all, a very solid Cab, particularly under the $20 price point. I've seen this priced anywhere from $12-20 depending the retailer, so shop around. This would pair equally well with grilled steak or chocolate brownies, or perhaps even, yes... chocolate cake. Like all Layer Cake wines I've had thus far, it's rich, deep, a bit decadent, and definitely far from subtle. Do I like it as much as their Malbec or Primitivo? Nope. But it's still pretty damn tasty. Drink This: if you want a very solid, rich Cabernet Sauvignon for under $20. Don't Drink This: if you prefer white wine or like your Cabs on the subtle, softer side of things.